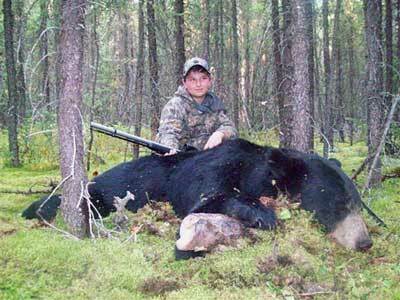 Dean McCulloch of Muskeg Country Outfitters offers remote trophy black bear hunts in Northern Manitoba. An island based remote camp, and bait sites that are strategically located far away from noise and traffic. Our camp is centered amidst a beautiful wilderness location in Manitoba, Canada, known to harbor some of the largest black bears in the world. Manitoba bears come in a wide variety of colors ranging from jet-black to a white blonde. 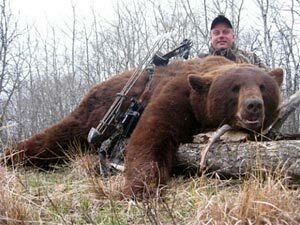 Due to our remote location and over 300 square miles of hunting area, the vast majority of our bears have never been hunted before or encountered a human. 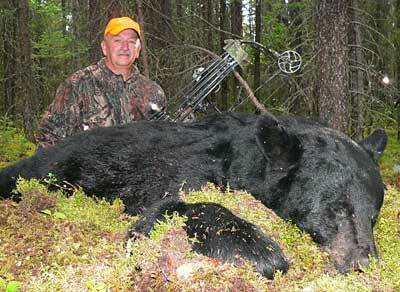 We offer spring bear hunts for rifle hunters as well as bowhunters. In addition, fishing is always there for those who cannot resist the extra fun. Hunting for black bear from one of our baited tree stands is comfortable and safe. Our bait sites are well maintained and we have both large 4-foot by 4-foot platforms and 15-foot ladder stands available at each location. You will stay in a tent camp and enjoy hot showers with all of the amenities. Friendly cooks supply hearty, excellent-tasting meals, and our professional guides have over 40 years of bear hunting & guiding experience to ensure all our clients have a relaxing and adventurous stay. Ground transportation from Thompson is provided along with boats to the camp and bear sites. Taxidermist work is available upon request. All baits, tree stands, guides, and skinning and trophy care services are also provided. For more information on available dates and price quotes go to the Muskeg Country Outfitter's web site below. To book a hunt now call: 204-677-8134 or E mail.